The NetBSD Project is pleased to announce NetBSD 7.0, the fifteenth major release of the NetBSD operating system. The last release is quite some time ago, but given a philosophy of "it is ready when it is ready" and the amount of work that went into it, this is a very good reason to celebrate! See the official release announcement for a long list of hilights and harder to notice changes. Also, there is an article on What to expect in NetBSD 7 which also describes many of the new features, changes and bugfixes in NetBSD 7. Security: prevent kernel panics via userland requests from kqueue, a random number generator update to prevent weak cryptographic keys and a vulnerability in grep. Networking: many updates to NetBSD's new packet filter npf, and improved SMP operations. Platforms: device driver for Hydra and ASDG Zorro2 bus network cards on Amiga, x68k's bootloader can now boot from CD and network, and dtrace support on amd64. Drivers: add LSI Thunderbolt (SAS2208) controllers, Apple's Thunderbolt to Gigabit Ethernet adapter, and improve stability with multiple concurrent file system snapshots. 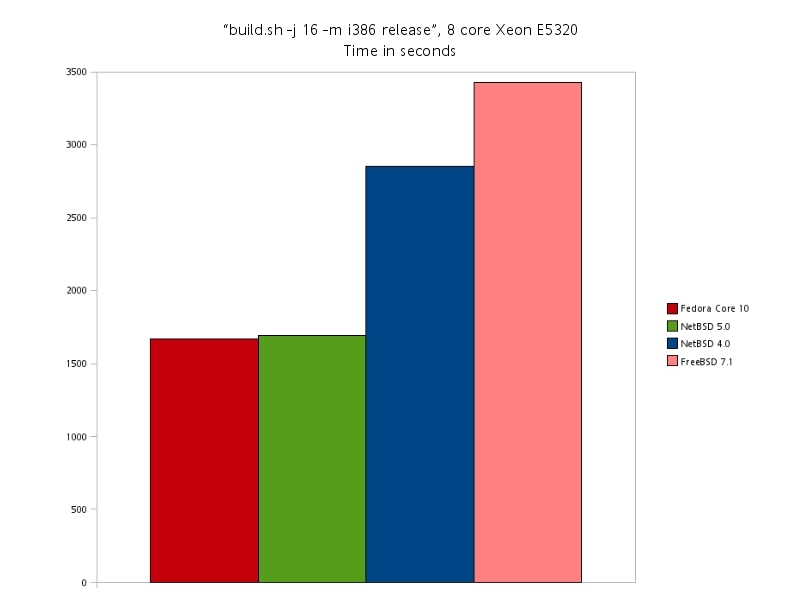 Improving network stack concurrency and performance. Development of modern file systems and improvement of existing ones. Features which are useful in embedded environments, such as high resolution timers and execute in place (XIP) support. Automatic testing and quality assurance. For more information about donating, visit http://www.NetBSD.org/donations/ The NetBSD Foundation is a 501(c)(3) organization in the US, and donations may be tax deductible. Those of you who prefer to build from source can continue to follow the netbsd-5 branch, but the netbsd-5-1-RC3 tag is available as well. See src/doc/CHANGES-5.1 for the list of changes from RC2 to RC3. Those of you who prefer to build from source can continue to follow the netbsd-5 branch, but the netbsd-5-1-RC2 tag is available as well. See src/doc/CHANGES-5.1 for the list of changes from RC1 to RC2. Andrew Doran has made an overview of NetBSD 5.0, available as HTML and PDF, which includes a general description of what NetBSD is, what's new in 5.0 and what is important for users of workstations, servers and embedded apps as well as for developers and hobbyists. 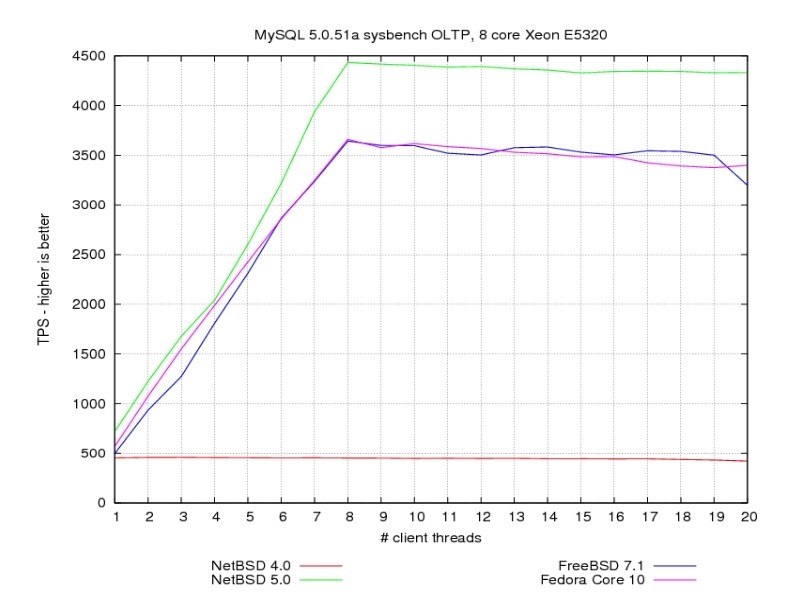 Besires the lists of features, the most interesting part is a number of benchmarks that show that NetBSD can compare well to FreeBSD and Linux (by usually beating them 8-). A list of possible features for NetBSD 6.0 concludes. 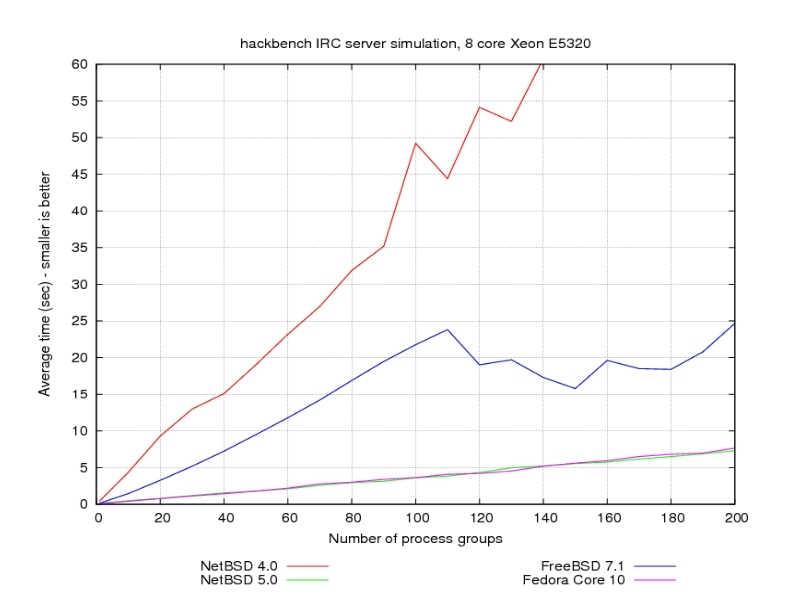 NetBSD 5.0 is released: ``NetBSD 5.0 features greatly improved performance and scalability on modern multiprocessor (SMP) and multi-core systems. Multi-threaded applications can now efficiently make use of more than one CPU or core, and system performance is much better under I/O and network load. We are very grateful to all of those who donated during the 2007 fund drive, which brought us many of the great advances found in 5.0. For more information on how you can help NetBSD, see http://www.NetBSD.org/donations/'' See the NetBSD 5.0 release announcement for more details. Soren Jacobsen writes: ``Today, we have two things to be happy about. First, the fourth release candidate of NetBSD 5.0 is available for download. Second, this announcement, like RC3's, coincides with an important birthday: that of Billy West. Added the RLIMIT_AS resource, which limits the total address space available to processes. As usual, src/doc/CHANGES-5.0 has the full details. Those of you tracking by source can either continue following the netbsd-5 branch or use the netbsd-5-0-RC4 tag. Further X.Org refinements, including switching sgimips to X.Org. Scheduler Activations support is now disabled by default in sysctl.conf. ddb.onpanic is now set to 1 in the kernel by default, but 0 in sysctl.conf. This avoids trying to dump if a crash occurs during the install phase. puffs is now enabled by default on amd64, i386, macppc, and sparc64. SSP kernels should work again. A handful of assorted stability improvements. As always, see src/doc/CHANGES-5.0 for full details. Those of you tracking by source can either continue following the netbsd-5 branch or use the netbsd-5-0-RC3 tag.